Rosa Loy, Haarversteck, 2018, casein on canvas, 19 3/4 x 15 3/4". In Leipzig-based painter Rosa Loy’s phantasmagoric compositions, the industrious, rosy-cheeked women of socialist realism are recast in Kafkaesque mise-en-scènes, in which they farm human-faced heads of lettuce, feed lollipops to Harpies wearing headbands, and recline on couches in poses of analysands more than odalisques. Loy imbues her scenes with the hazy sense of half-remembered dreams by using the water-based paint casein, which allows layers of underpainting to show through the thin washes on top, keeping colors and figures from being fully resolved. Often appearing in groups of two or more, her cast of female characters inhabits a separatist world in which women’s spaces are sites of fable-like narratives dense with symbolic, if enigmatic, meaning. 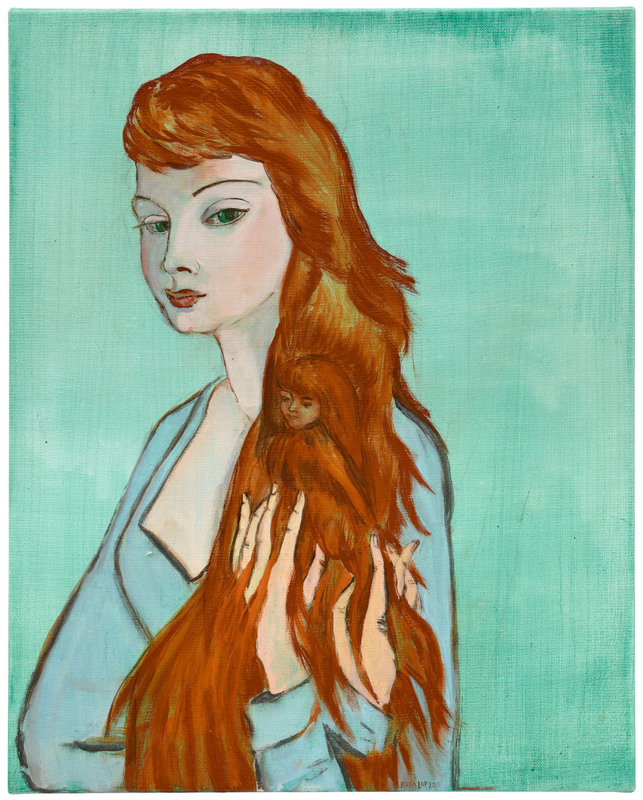 Many of Loy’s women have long, thick hair—an art-historical fetish that she exaggerates and makes strange. In Haarversteck, 2018, for example, a sultry redhead entangles her fingers in her own waist-length mane. The woman calls to mind Courbet’s Jo, la belle Irlandaise, 1865–66, but upon closer inspection, it becomes clear that Loy has warped the woman at her toilette into something more insidious. While Courbet’s woman sensually runs her fingers through her wavy tresses, Loy’s awkwardly holds all ten twisted fingers in her thick locks. Eerily anthropomorphizing Courbet’s symbol for woman, Loy has also painted a tiny woman’s face among the strands, as if the hair were its own character. Each of her paintings picks apart the visual construction of such tropes, prodding viewers to contemplate their own scopic pleasures.